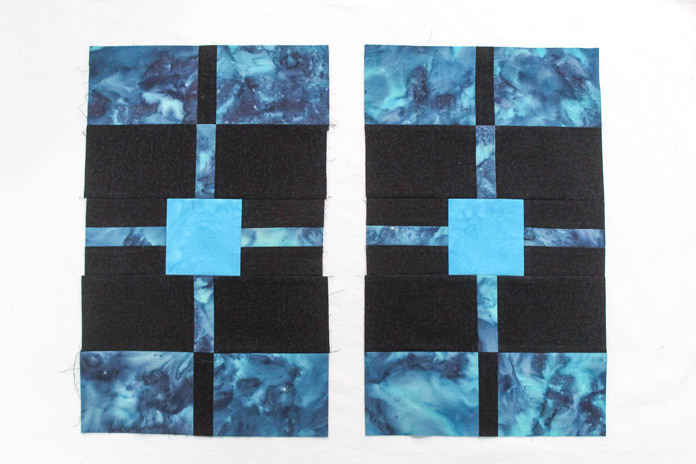 Home » Northcott » The best tip for squaring off your quilt blocks! In yesterday’s post, I mentioned how much I loved working with Omnigrip rulers. In this post, I’ll go over my best tip about how to square off quilt blocks using the 20½” square ruler. It’s the small details that really help keep the design in good alignment. Before cutting off any excess fabric, I ensure that my vertical and horizontal lines align with my center strip. I also ensure that my diagonal is aligned with the corners of my squares, Only when they all match, I cut off excess fabric… if any. In Step 8 of yesterday’s post, I mentioned to resize the block to 15½” square. But how do we really resize without losing sight of the center strip? Because that’s the focal point of the quilt! This is the most common mistake we come across when quilt-making. We get so caught up with having to measure the blocks a certain size that we seem to forget what’s truly important to measure. In this case, it’s important to ensure that the center strips are always at the same position so that when we stitch the blocks together they will align. So think about this when you’re ready to resize your blocks… when you need to trim off excess fabric… do you really want to cut without checking where that center strip will be? Ensure that the vertical and horizontal lines align with the center strip. Also, ensure the diagonal is aligned with the corners of each square in the block. 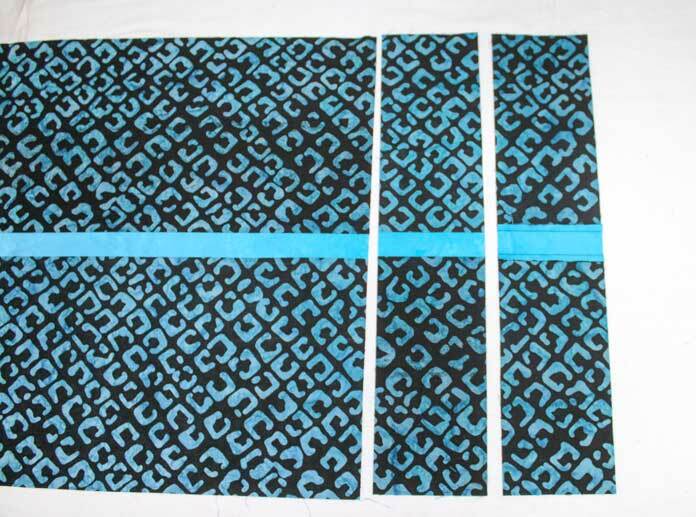 Only when they all match, can you confidently cut off any excess fabric. Now let’s start on making our 13 units of the Block B. 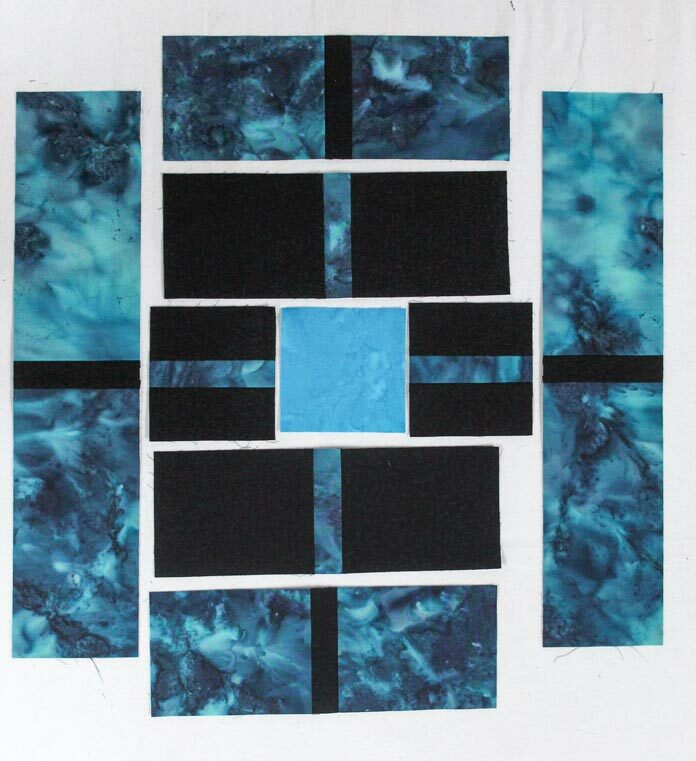 You probably didn’t notice in the pictures, but for my overall look of the quilt, I decided to make one of the blocks with a different fabric as the center block because this block will be in the center of the quilt. 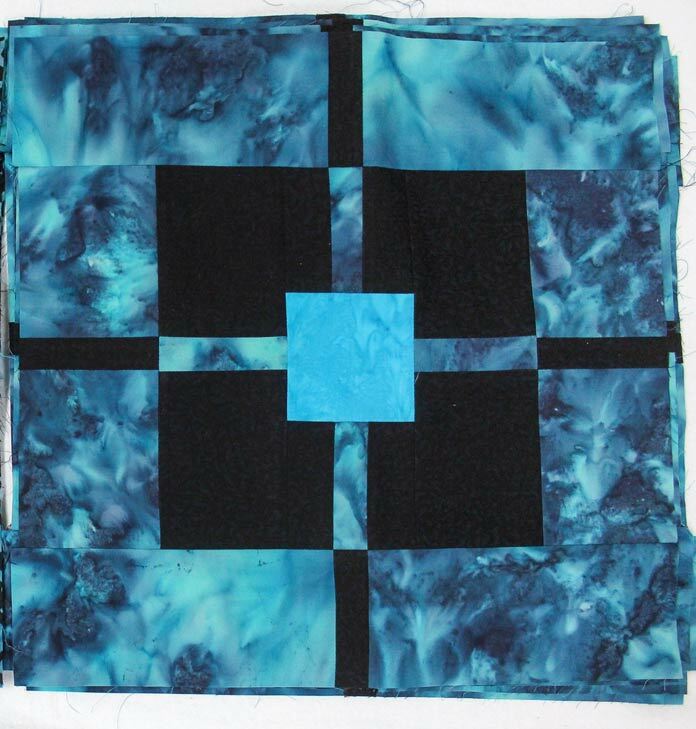 So don’t hesitate to make one center block with a different fabric… it will be your signature! 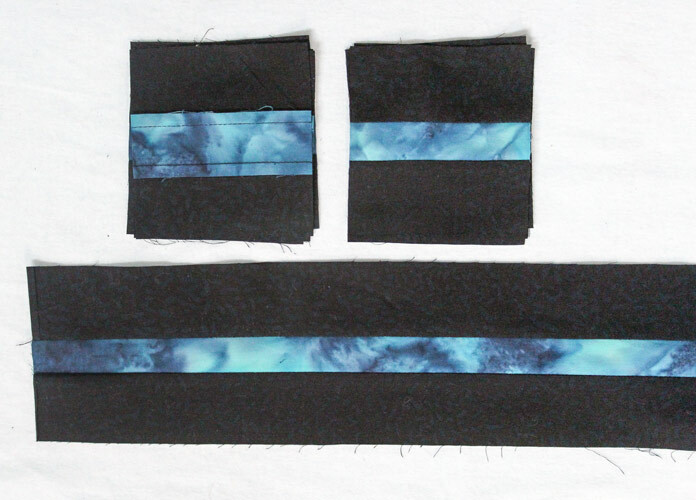 Stitch two L strips along a D strip. Strip should now measure 3¾”. Repeat to make three strips. 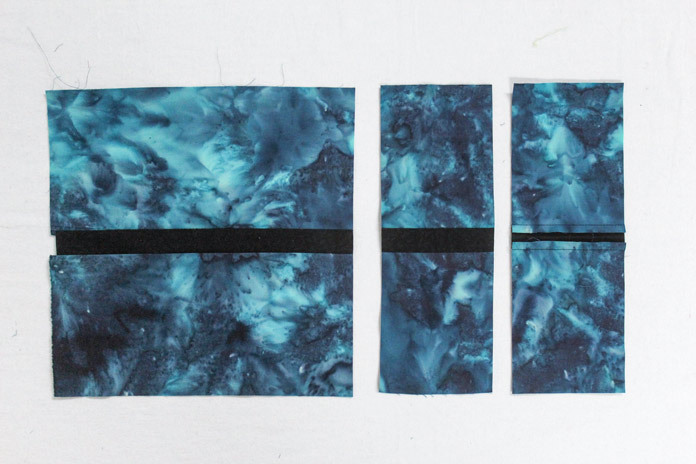 Cut to make 24 rectangles size 3½” x 3¾”. Stitch (2) step 1 rectangles along a G square. *the rectangles are slightly larger than the square, so you need to align the centers on all. Simply fold in half and press all units and align on the crease when stitching together. This will ensure proper alignment. Cut to resize to a 9½” x 3½” rectangle. The top unit is before the trimming process. Use an omigrip ruler with the special windows to square off. Stitch (2) F strips along an A strip. Repeat to make 3 strips. Cut to make 3 strips. Cut to make 26 rectangles size 3½” x 9¾”. Stitch two F strips along an A strip. 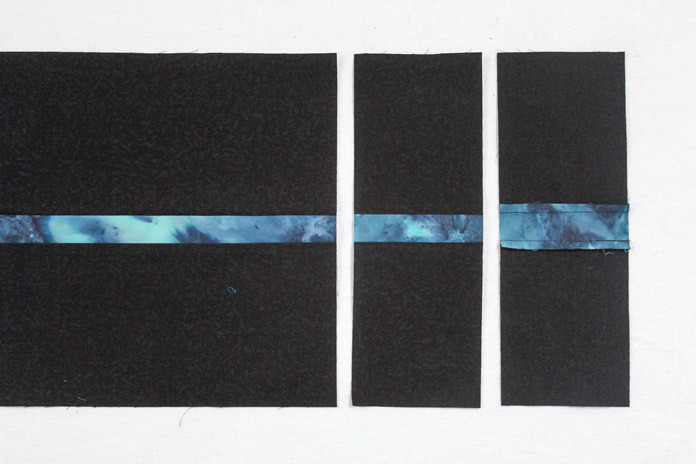 Stitch (2) B strips along a D strip. 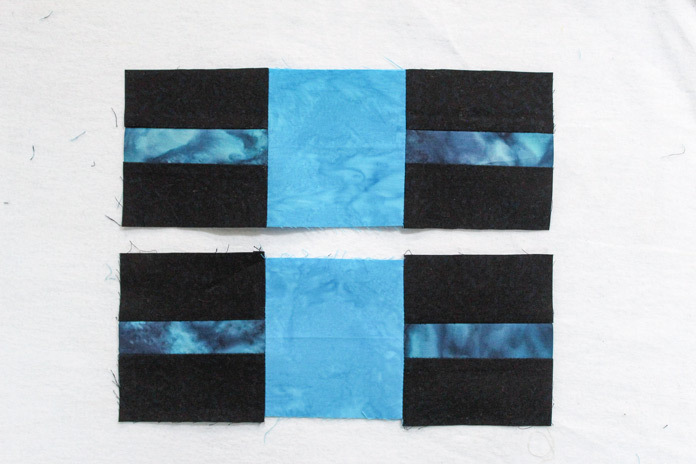 Stitch two B strips along a D strip. Stitch a Step 3 rectangle to a step 4 rectangle. Unit should measure 6½” x 9¾”. * Ensure that center strip is aligned. Stitch (2) rectangles beside a step 2 rectangle. * The step 5 rectangles are slightly larger than the Step 2 rectangle. Align with center strip again by finding the center of the step two units and align that center the center of the step 5 units. Cut to resize to a 15½” x 9½” rectangle. Stitch (2) C strips to a D strip. Cut to make 26 rectangles size 3½” x 15¾”. Stitch two C strips to a D strip. Stitch (2) units of Step 7 on each side of Step 6. * The Step 7 rectangles are slightly larger than the Step 6 unit. Align the center strips. 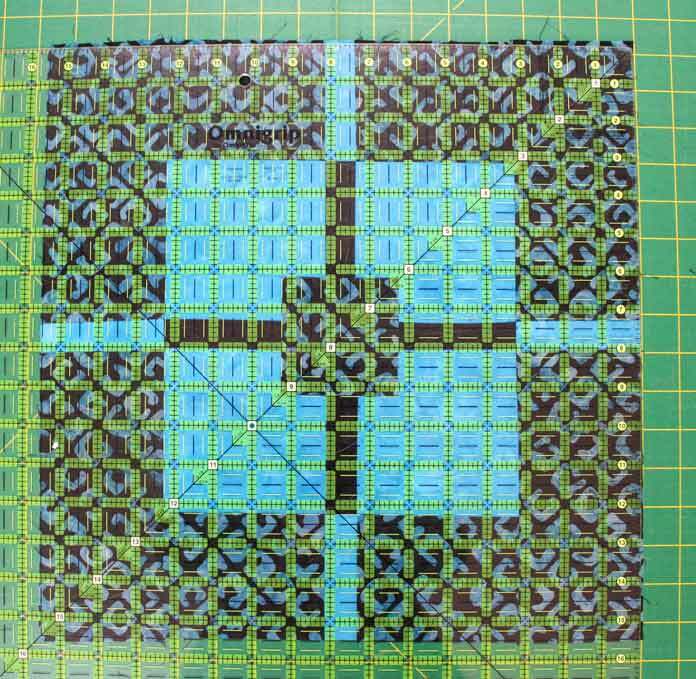 Resize to a 15½” square. Repeat to make 13 units. Stitch 2 units of Step 7 on each side of Step 6. So congratulations! Your blocks are done and you have my best tip to square off the blocks. 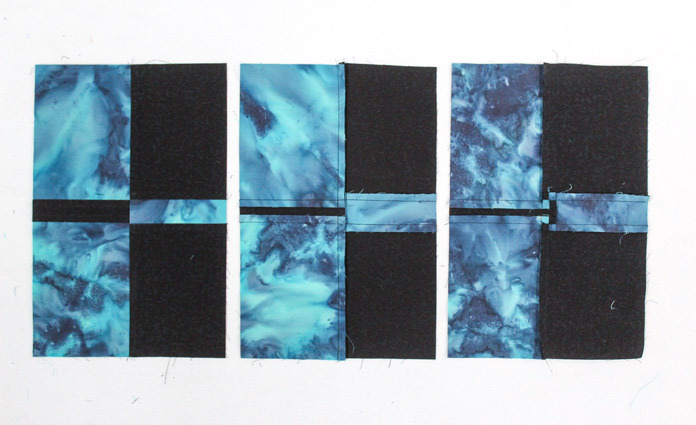 Don’t you just love how the Banyan Batiks look in this block? You don’t have to do it right away, you can wait till tomorrow to read my next tip to stitch the blocks together and you’ll feel much more confident.